Click the link below to find the lesson plan for each topic. 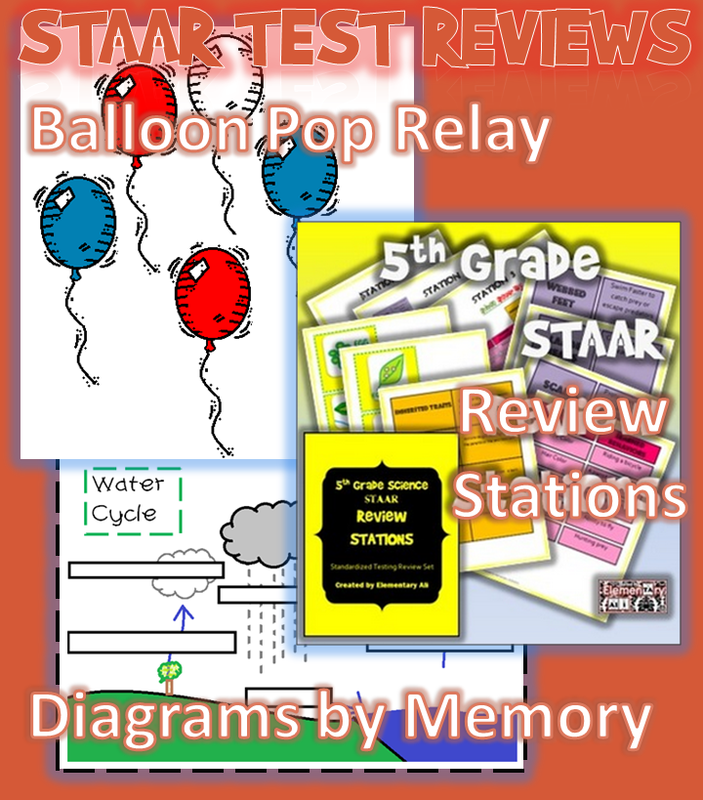 I have created a set of 15 review stations that I love to use when reviewing for the Science STAAR. I like to take every Friday starting two months before the STAAR test and make them review Fridays. I rotate through two stations per group each Friday. By the time we get to the STAAR test, each student has seen all parts of the review. I have also used these stations as a boot camp style review week. However they get used, the STAAR stations help the kiddos review concepts that will be on the test. I started this activity to help the accommodated test takers because they could use unlabeled diagrams on the test. I had a class activity in which I would call out a diagram and each student had to draw it from memory. It was a fun game we even played with dry erase boards and dry erase markers on desks. It ended up helping the entire class, not just the accommodated test takers! And the kids loved to play it. The kids love this active game! I cut out 100 multiple choice released STAAR test questions and put each one in a balloon. The one hundred question balloons should last through three classes. The balloons are placed at one end of the gym and the students line up at the other. They will take turns in line running down to pop a balloon and answer the question inside. The student reads the question out loud to the “answer checker” ( I like to have one answer checker per line, but you can stand at the end and whoever gets there first can read their question first). They can go back to the next runner in line by answering correctly. If they are incorrect, I just let them keep giving answers until they have the right one. Then, when they get it correct they can read the question and answer all together correctly to run back to their relay line. I usually print a numbered master set of questions with answers for quick reference. This is also a great way for the P.E. teacher to help the kiddos get ready for the STAAR test. I always prepare the balloons for them- its a little bit of work. Unit Test reviews are just as important throughout the year. The goal is not to memorize for the test, but to refresh their memory and help make those memories permanent. Quick writes: Ask the students a higher level question, and have them write a paragraph or half a page fully explaining their response. Give them a shorter amount of time to get this writing completed such as 10 minutes. You will have a good idea of who “gets it” and who doesn’t. Test Review Baseball: Using a pool noodle as a bat and a balloon as a baseball, pitch the ball to each student. At each base they must answer a review question correctly to advance to the next base. Four correct answers will earn them a home run. Keep score per student, or in two teams. Students need to pay attention to each question you ask other players because they might get that same question when they are up! Jeopardy: You can draw a jeopardy board on the whiteboard or in PowerPoint. Ask the students questions in teams, and correct answers will earn the money amount written for that question. White board review: Have students answer questions using white boards. This allows the whole class to participate each time. I would have them write their answer and turn it over on their desk. When you say “show me”, then they can put their board up. I have also made this game a race to see who can get their answer board shown to me first. Either way is exciting. Whiteboards are a great way to review any diagrams or cycles you have studied!